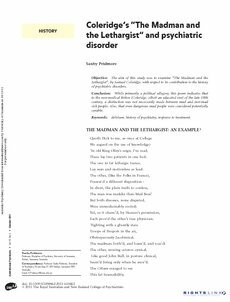 Objective: The aim of this study was to examine " The Madman and the Lethargist " , by Samuel Coleridge, with respect to its contribution to the history of psychiatric disorders. Conclusion : While primarily a political allegory, this poem indicates that to the non-medical Briton (Coleridge, albeit an educated one) of the late 18th century, a distinction was not necessarily made between mad and non-mad sick people. Also, that even dangerous mad people were considered potentially curable.